Crickets can be distinguished from their relative the grasshopper by the way the wings are carried. The cricket will keep its wings folded around the body whereas the grasshopper will carry them folded and above itself. The house cricket, the camel cricket and the field cricket are the three most common cricket invaders of a home. Crickets will feed upon plants as well as insects and each other. They will cause damage to paper or fabric when in large numbers. Clothing stained by food or sweat are common targets. 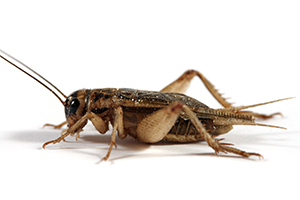 Control of crickets includes having well-groomed shrubbery and grass, eliminating harboring spots up against the house, minimizing outdoor lighting strength and use, sealing holes in the house, keeping doors tight-fitting and screening in all windows. The name earwig comes from a superstition that these insects would enter the ears of sleeping people and bore into their brain. Their color varies from pale brown with dark markings to reddish brown to black with pale legs. The pincers are the most identifiable characteristic extending from the end of the abdomen. They have 2 pairs of wings: front wings, leathery, short and meeting in a straight line down the back, and hind wings, membranous fan-shaped and folded under the front wings. 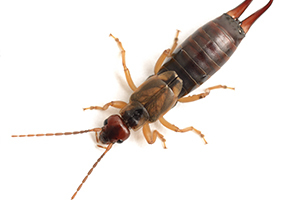 Earwigs are nocturnal, active at night, and hide during the day in moist, shady areas. They can be found under planter boxes, stones, logs and in mulch. The earwig feeds on live or dead plants and insects. 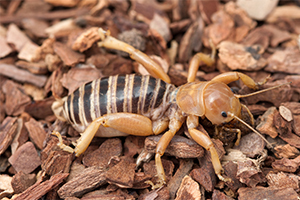 The potato bug’s actual name is the Jerusalem cricket. It is brown with black bands on the abdomen and has a large head. These crickets are nocturnal and can be found by turning over rocks and wood. They feed on other insects and spiders. The Jerusalem cricket is known to also have a powerful bite in defense but does not have any venom. They aren’t considered aggressive but will defend itself if mishandled or mistreated. Potato bugs like to hide under rocks and gravel, and like drier climates. They like to eat other bugs, decayed plants and roots, and, you guessed it: potatoes. 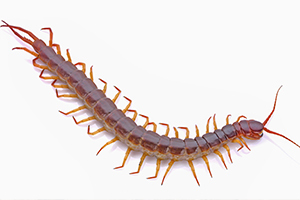 The adult centipede is long, flattened, wormlike and can have over one hundred pairs of legs. They have from 15 to over 150 segments, and each segment has one pair of legs. The color is usually yellowish to dark brown and sometimes has dark stripes. 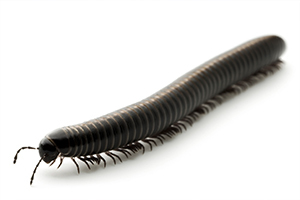 Some species of the centipede can inflict a painful bite but is not lethal. All centipedes have poison jaws with which they inject to kill their prey. Most centipedes are nocturnal, coming out at night, unless disturbed. They are found in areas of high moisture such as bark, rotting logs, under stones, trash, piles of leaves and grass clippings. Centipedes are primarily carnivorous and obtain their required moisture from their prey. People say these guys are helpful in ridding homes of unwanted pests like cockroaches and moths. House centipedes like hiding in bathroom drain holes, so beware! The adults are usually cylindrical and wormlike with up to one hundred pairs of legs. They usually have more than 20 segments on their body, and each segment has two pair of legs. They are blackish to brownish in color but there are some that are red, orange or with mottled patterns. Adult females can lay hundreds of eggs in soil or decaying matter that will hatch in several weeks and usually reach adult maturity in a couple years. Millipedes are typically found in places with high moisture and decaying vegetation. They also feed upon the decaying organic matter such as plant material but will feed upon dead insects and are known to eat their molted skins to replace lost calcium. Scorpions have eight legs, a pair of pinchers, mouth pinchers and a tail with a stinger. 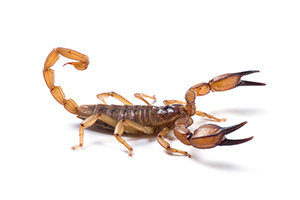 The sting of a scorpion is somewhat non-venomous and in most cases, is no more poisonous than a wasp sting, although there are some species that are particularly more poisonous than others. Scorpions will sting if crushed or if they are disturbed. Outside you can find the scorpion under rocks, logs and loose bark. Scorpions are most active at night. They are attracted to moist areas. Methods of control include removal of unnecessary rocks, logs, trash or debris. Also, make sure the house is properly sealed up. The pillbug is commonly known as the “roly-poly” because of the way they roll into a tight ball when disturbed. The pillbug is not considered an insect but rather an arthropod. They are concave on top but flat underneath with 7 pairs of legs. The eggs are deposited and hatched within the pouch that is on the underside of the pillbug. The pillbug is confined to areas of high moisture because they lack a closing device for respiratory purposes and they lack an outer waxy layer on the exoskeleton to prevent water loss. 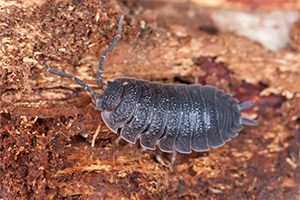 The pillbug remains inactive and hidden during the day and can be found around the base of buildings, around trash, boards, rocks and other quiet areas. They feed on decaying organic matter such as plants and sometimes an occasional animal. The sowbug, like the pillbug is classified as an arthropod. They are convex on the top of their body and flat or hollow underneath with 7 pairs of legs. 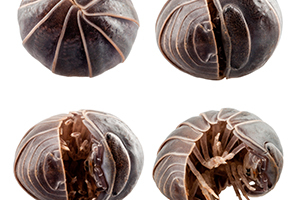 The sowbug does not curl into a ball like the pillbug. Eggs are deposited and hatched within the pouch that is on the underside of the sowbug. 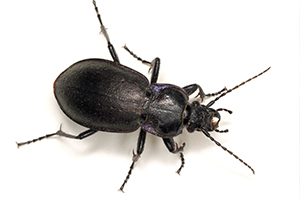 Sowbugs are confined to areas of high moisture because they lack a closing device for respiratory purposes and they lack an outer waxy layer on the exoskeleton to prevent water loss. The sowbug remains inactive and hidden during the day to minimize water loss, and can be found around the base of buildings, around trash, boards, rocks and other quiet areas. They feed on decaying organic matter such as plants and sometimes an occasional animal. There are many types of beetles or some are quite colorful. They come in many sizes and shapes. Beetles are usually found outside under rocks or in trees. Many beetles will be attracted to light and are more of a nuisance than anything else. The beetle can be beneficial by feeding on insects and larvae of unwanted pests. Many people are curious about beetles and request additional information, which requires specific identification. Common beetles found in homes include the Rice Weevil (likes to eat and hide in grain and cereal products), the Grain Beetle (like to infest stored grain and other dry food products), the Cellar or Churchyard Beetle (likes to live in dark places, found in and around homes and other structures, and also in roof spaces—they like to feed on animal waste and vegetable matter), and the Carpet Beetle (like to eat woolen textiles like carpet and furs). 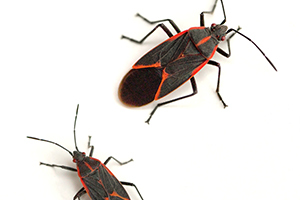 The boxelder bug is black with orange or red markings. During the fall season, they will leave their host tree and a structure to over winter. They do not sting and will seldom bite. The best time to control the boxelder bug is when they are sunning themselves in the late fall and early springtime. If one gets squashed, they will leave behind a dye that stains clothing and carpet. They love the outdoors in good weather, hanging out in parks or gardens, meadows or forests. These long-legged, thick-thighed bugs are actually more scared of you than you are of them. Even with their spiky edges, leaf-footed bugs will abandon scene at the slight hint of danger. Sometimes they can emit a loud noise or foul odor if they feel threatened. They like to eat plant juices, and they love living inside prairie plants, trees, bushes and shrubs. Stink bugs normally like to eat off fruits. The nymphs like to feed on fruits as well, plus plant and flower stems and leaves. 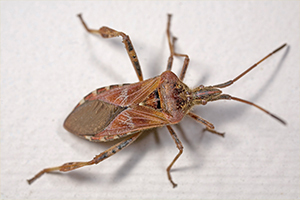 This six-legged insect is a greyish-brown, triangular-looking crawler, named because it releases a foul odor from its rear end when it comes in harms way. 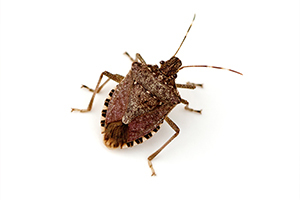 Stink bugs hang out outside in the warmer months of the year and enter homes when it gets cold outside. They destroy crops when high in numbers, and become a nuisance once they’ve established a home within your home. The springtail is a very small insect measuring about 1/25 to 1/12 of an inch. They can be found in places where it is damp, moldy or has organic debris such as the bathroom, kitchen and the basement. 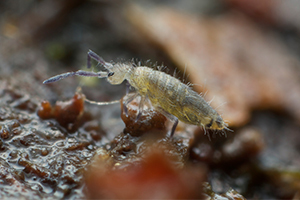 The springtail is whitish to gray in color and lacks wings. Springtails do not bite. They will feed upon fungi, spores, algae and decaying vegetable materials. Springtails are attracted to light and due to their size can crawl under doorways to enter a structure. Elimination of these insects focuses on moisture control, sanitation and reduction of mulch and other materials around the base of the house.